Because Windows is a multitasking operating system it has several ways to try and manage running processes and help make your computer run more smoothly. Besides Affinity which controls how many processor cores a program can run on, there’s also the priority at which a process runs, this gives the program a setting while running that tells it how high up in the queue it’s placed when asking for processing time. For example, if you’re running a processor intensive task and it has a higher priority than your web browser, it’ll use all the CPU time and the browser will get what’s left over and run very slowly. If they have the same priority, the browser will work better but CPU usage will be shared so it still may be slow or jumpy. Give the intensive task a lower priority and it will only take the CPU time left over, speeding up the browser. 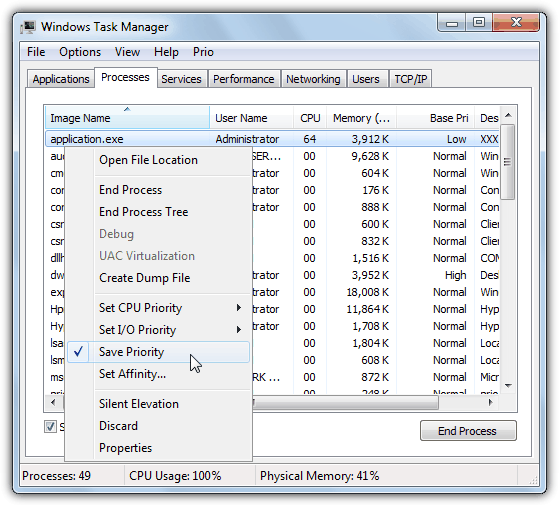 Changing the priority of a process yourself is very easy, just right click on it in Task Manager and set it to the level you want. This is still an issue on single and dual core computers because one process with a medium or high priority can bring the system to its knees by hogging all the CPU, even system tasks like Windows Update can do it from time to time. Tools like Process Lasso were developed to try and automatically juggle process priorities but they give very mixed results. The problem with changing the priority of a process in Task manager is as soon as the process is closed, the priority will be reset to its default level next time you run it. Here we have 5 tools that allow you to save the priority of a process so you don’t have to keep adjusting it manually every time the process is started. 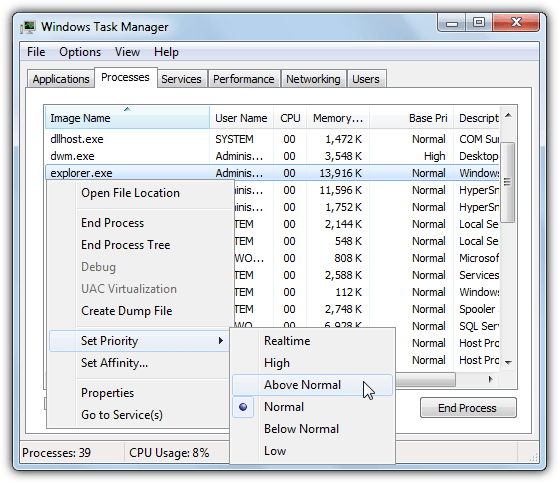 Prio is a very easy solution to this problem of Windows Task Manager not saving priorities because it’s actually an add on component for Task Manager itself giving it the ability to do just that. This means you don’t have another full blown program running in the background, only a Prio service exe consuming a tiny 384KB. Making a permanent priority is simple and obviously done through Task Manager, simply right click and set the priority like you normally would. Then right click again and tick Save Priority which is a new option added by Prio. Prio also adds better tooltips, optional TCP/IP and enhanced Services tabs, integrity checks and a Silent Elevation option. It’s free for personal use and works on Windows 7 and below, it doesn’t work on Windows 8 or above. 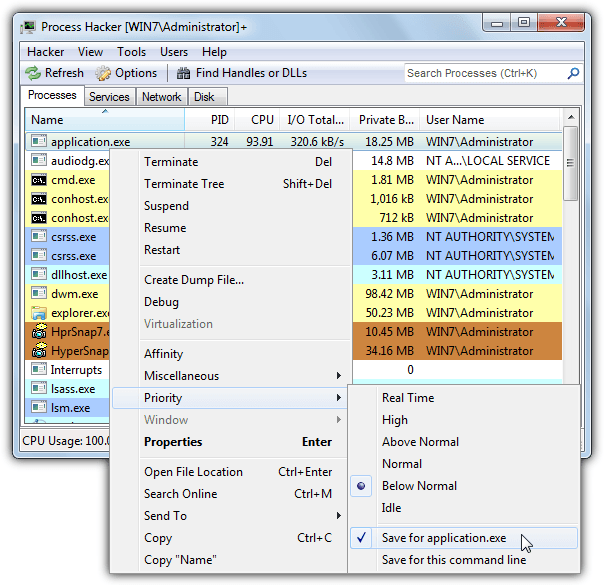 Process Hacker is a well known Task Manager replacement that has a number of advanced functions for handling tasks and processes, and like any task management tools, being able to adjust priorities is a standard part of that. 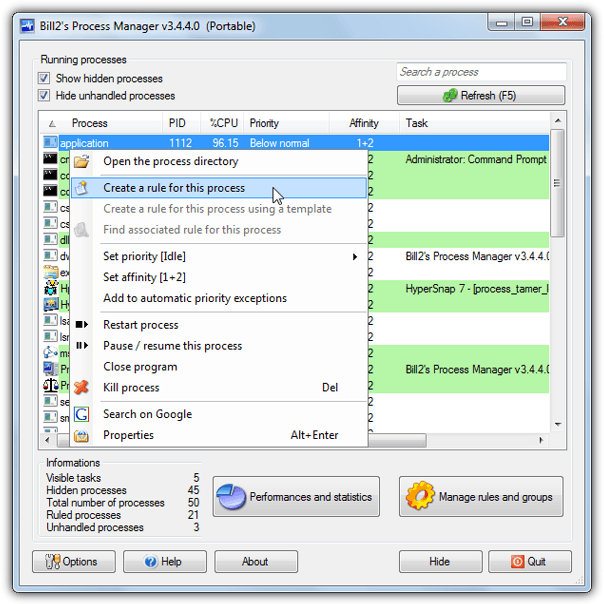 The ability to save the priority for any given process was added to version 2.30 in early 2013. To set the priority to be saved in Process Hacker, right click on the process, go to Priority and set the level you want to run from now on. Go back to to the same menu and enable the “Save for application.exe” option, then it will be remembered in future for *****.exe every time you run it (and Process Hacker is running). A portable version is also available. About 7MB is used while Process Hacker is in the system tray. This is a small process management utility that can automatically adjust the priority for running processes when they reach a certain level of CPU usage. However, you can easily turn this off and just set it to adjust process priorities based on what you select manually. 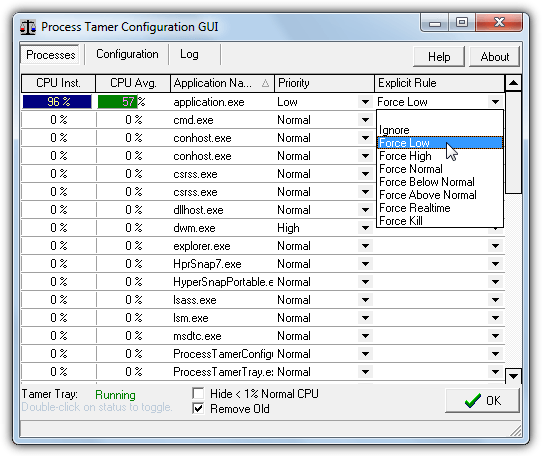 Go to the Configuration tab and untick “Tame Applications Based on CPU Usage”. Making Process Tamer remember a priority is easy, just click on the Explicit Rule drop down menu on the row of the process and select what you want it to be set at. Rules can be deleted or added manually from the Configuration tab. Memory usage is very low and only consumes around 1.5MB while in the background. Although the program is free it does require registration for a free key to stop popup nags. This utility is a bit like Process Tamer in that it can automatically adjust process priorities based on their CPU usage, you can also turn this off and rely on your own settings by unticking the function in Options > Automatic priority. Bill2’s Process Manager works on the basis of rules and is quite a useful program to apply sets of rules to a specific application process while it’s running. To apply a custom priority right click the chosen process entry and select “Create a rule for this process”, tick Set priority in the rules window and choose the priority you want to run from now on. Memory usage is quite high while Process Manager is in the background, around 20MB. This might be a bit much for lower end machines. A portable version is also available. The default language can easily be changed to English in the Options window. 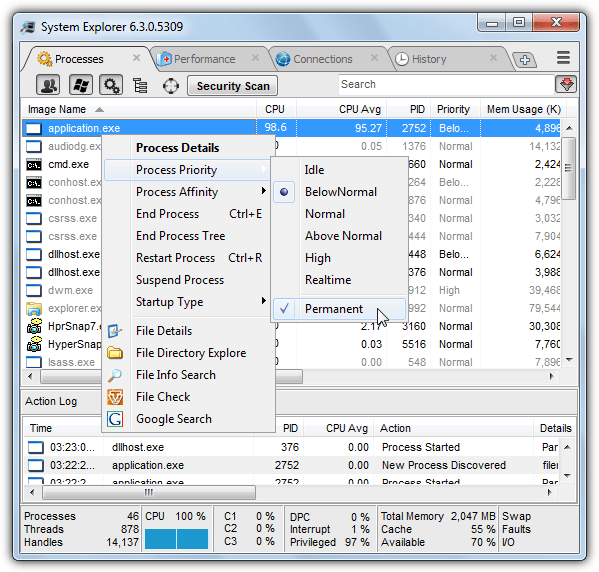 System Explorer has a huge array of system information and control components, all accessible via a series of web browser type tabs. It’s like Task Manager on steroids. As Process Hacker, System Explorer also has the ability to save a given process priority and keep that setting when the program is launched in future. Make sure you’re in the Processes tab and right click on the chosen process, hover over Process Priority and set the level you want to use. Go back to the same menu and tick Permanent to make the setting stick. While in the tray, System Explorer uses around 12MB of memory which isn’t that bad considering the amount of functions on offer. A portable version is also available. Note: Antivirus and security software often cannot be tampered with if they have self protection on, which means you won’t be able to alter the priority. Also be careful and don’t touch priorities of system processes like svchost unless you really know what you’re doing, this could have unforeseen issues on general performance and other running tasks. Absolutely loved Prio, but it didn’t work in Win10. I read something about maybe an update for it in the comments. I just retried it and it still doen’t work in win10. Funny, how there is indeed a Win10-dll in the install folder. It does work in Windows 10 after the recent update, if your process priority options are not there, it might be an idea to uninstall and reinstall Prio. The options are there, but the priority is reset after restarting the process. No, Prio does not work with Windows 10 anymore. Creators Update broke the tool and it no longer works. I have contacted the company many times over the past year and they ignore everyone. I was given the opportunity to test the Win10 BETA and worked great. Once Creators came out it stopped working and for good. Do you mean the Fall Creators Update (Oct 2017)? I tried it on the standard Creators Update a few months back and it worked (up to a point). Thanks. I used Process Hacker. There’s a workaround to hide the tray icon for it. Go to View > Tray Icon. It won’t run in the background if you uncheck all of them. Instead select one that says “unavailable” on it and uncheck the rest. For me that was “Disk history”. Then double check File > Options and ensure the startup and hiding options are checked. Now it runs in the BG with no visible icon and the priorities auto adjust properly. I forgot “realtime” priority can damage your pc. I have a “prio” installed and it works on windows 10.Just instal “prio”, restart pc, run application you wanna go on low or high priority, go to task manager —-> details and set the priority you want. when you click with right mouse button on an application you want to change priority in “details” position. Thanks for the reviews…definitely helped point me in the right direction. Still having a small problem. Do any of these reviewed work without a user being logged in and running the process application? I need these settings to be persistent across a reboot on an unattended machine. I’ve tried a couple (Including Process Hacker) and it seems when a non-Windows process I have set to run below normal starts, it only starts with the priority I set if the process-adjusting application is running…if it is closed, it starts with the priority it always did. If none of the above apps do this, is there a way to set the process priority of a service and/or process name without having to be logged in and have the above app running? One of these programs needs to be running in order to change the app’s process priority from the default, that’s why they are needed in the first place. I don’t think this person who wrote the article did a very good job at TESTING “Prio” with Windows 10. It doesn’t work with Windows 10. The person who made the software never updated it to do so. The article clearly states Prio “works on Windows 7 and below, it doesn’t work on Windows 8 or above.”, did you not bother to read that part? Prio had an update in early 2017, about 6 months after my comment that it didn’t run on Windows 10. Previous to this latest 2017 update, the last version of Prio was from 2012, before Windows 8, 8.1 and 10 came out, which is why it didn’t work. There is a “*win10.dll” file in the app’s directory, as well as *win7, *vista, *xp and *nt libraries. I don’t have a dedicated Prio-menu with the rest items in Task Manager. Also no TCP/IP tab and the Services-tab seems unaffected. I installed today, so it’s the latest version available. Works fine so far. Just downloaded Prio on Vista 64 and Task Manager crashes when clicking on “show all processes”. Any fixes to this bug? Not a full fix but there is a workaround which is to disable User Account Control (UAC) on Vista. Prio still has a one or two issues on Vista such as crashing if you enable integrity checking, but it seems to work OK if you don’t mess with that setting. should be also mentioned here: Proces Lasso. depending on version and it will keep on working. The many available settings can make one’s head spin. Simply download and install ProcessLasso.zip. It is unlikely that one can change things to all the desired settings in on session;it is definitely not for the newbie. Prio is instead recommended for the computer challenged individual. If you have read the article you will know that we do mention Process Lasso but it’s really a different category of tool which from personal experience gives very mixed results. The tools mentioned here are all quicker and easier to use for the task at hand. So a tool like Prio which does the intended job easily and effectively is only for the “computer challenged”? Does a tool have to be hard work and complicated to be considered good enough for a geek or advanced user?? Thank you so much. I have searched for a solution to this problem and System Explorer was perfect. I love that it can even tell you what dependencies a process has, and the process trees are a welcome feature. Glad it is windows 10 compatible. Great article! How did I do without one of these utilities for so long? Hey, HAL9000 – :-) you left out Sysinternals Process Explorer, the grand daddy of Windows process tools, which allows you to set priorities AND CPU affinities. However, I like Prio best for on-the-fly process-priority tuning because it simply adds a new tab to Windows Task Manager, so you don’t have to run a separate application. Note: For some reason I cannot get the prio.dll to register on my Windows 7 64bit machine although it runs fine on Windows 7 32bit rig. I tested Process Explorer a few times and it never saved the process priorities when you exit and rerun the program. If it is supposed to do that, it wouldn’t for me. That’s why I went for Process Hacker instead because it saves the custom priority of a process. Just a question, I saw a program listed up top called “process lasso” but no review is given in the article. Does it function as well as the other programs mentioned? Process Lasso is more of an automatic kind of program and it’s main aim is to control process priorities for you. A lot of people love it and and an equal or greater amount of users think it’s a terrible program and makes their computer worse. The free version pops up nags on startup and during program usage from 3 days after install, we decided not to add it and concentrate on programs where you have control over your process priorities and don’t annoy you more than help you. Thanks for the post, but unfortunately, only System Explorer works with Windows 8.1, 64-bit. The other four applications are all outdated: they either do not support Windows 8 as stated by the vendor or the feature in question does not work. For example, in Process Hacker, the option “Save for …” is absent from the drop-down menu (but shown in your screenshot). I’m not quite sure how you’re testing but Process Tamer, Bill2’s Process Manager and Process Hacker all work fine for me on Windows 8.1 64-bit and control process priorities correctly. In Process Hacker the “Save for ***” option is there the same as it is for Windows 7. Raymond, thanks for that. This is exactly what I needed to tame a backup process. Totally works in Vista – one of my Top Ten Apps of all-time, for sure. Keep up the great work.